Study Bachelor of Nutrition and Food Sciences at the University of South Australia (UniSA). Information for International students. Study both food science and nutrition and then choose to specialise in either nutrition or food science. Learn from a University that has well-above world standard research in Nutrition and Dietetics1. Learn in a dedicated on-campus nutrition and food science hub. Benefit from our strong links with the food industry and community. Study at the No.1 University in South Australia for careers and teaching quality in Science and Mathematics2. Get a taste of what it’s like to work in the food and nutrition industry when you attend field trips to some of the state’s major nutrition and food providers. Study a degree that is highly regarded - our graduates are in high demand. 2QILT: Graduate Outcomes Survey Course Experience Questionnaire 2016-18 – Full-time Employment and Teaching Quality Indicators (Undergraduate). Public SA-founded universities only. This degree prepares you for a career in the health and food industry, where you will be involved in developing innovative foods, promoting and managing diets and lifestyles, and conducting research for enhanced wellbeing. Our on-campus facilities are state-of-the-art, in fact, we have a dedicated nutrition and food science hub that is home to a $1 million commercial kitchen, sensory laboratory (one of only a few in Australia) and microbiology laboratory. You will also learn from award-winning academics, and get a taste of what it’s like to work in the food and nutrition space when you attend field trips to some of the state’s major nutrition and food providers. This unique degree offers practice-based and theoretical learning to ensure you are career-ready. During the first two years you will explore both nutrition and food science topics, gaining a solid understanding of the key elements of each. In the third year you will choose to focus on either nutrition or food science. 2. Electives are free electives chosen by the student. 1. Students who have successfully completed a Diploma in Food Technology at TAFE may be granted up to 36 units of credit towards the Bachelor of Nutrition and Food Sciences. Credit applications will be individually assessed by the Program Director. 2. 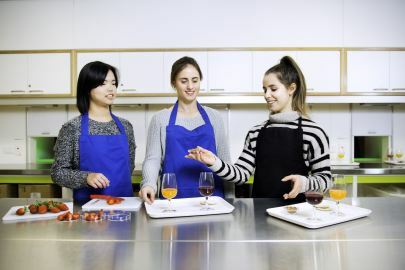 Students who are considering further studies in Dietetics and are currently in the Food Sciences stream, should note that as a pre-requisite for a Dietetics program they will need to choose one of these courses as a university elective. 3. Students who are considering further studies in Dietetics must successfully complete a nutrition course for one of their electives. 4. Students who are considering further studies in Dietetics must successfully complete this course. The growing awareness of nutrition and food quality as determinants of human wellbeing requires highly competent graduates who are capable of evaluating and communicating the most up-to-date findings in these fields. We offer some great on-campus learning resources, such as a commercial kitchen, sensory laboratory and microbiology laboratory, located in our dedicated nutrition and food science hub. The commercial kitchen is where interactive food preparation and cooking activities take place, such as cheese making, adapting recipes to make them nutritionally sound for different life-stages, texture modification of foods for the elderly, designing food quality assurance plans (in line with Hazard Analysis and Critical Control Points) and food and beverage fermentation (kimchi, sourdough bread, beer). Our sensory laboratory is one of only a few in Australia and is an interactive tutorial room where you will complete group work and research on topics including environmental sustainable food practice. Our microbiology laboratory is a space where you will be able to analyse microorganisms and explore interesting topics like food contamination. You will also benefit from our strong links with the food industry and the community, which will be beneficial as you begin to build important industry relationships and networks. You will be required to attend field trips to some of the state’s major nutrition and food providers as part of your studies – this glimpse into the food and nutrition world is a great opportunity for you to build industry relationships. You may visit organisations that manufacture spreads and dips, beverages such as beer and wine, as well as Australian native food bush tucker farms, and aged care facilities, focusing on food safety and food modifications for the elderly. We also have strong industry links with the food industry locally and nationally, which can provide you with another valuable networking opportunity. In addition, we host regular University-wide employee master classes and employment expos, and alumni events in Australia and overseas. Nutrition and food science experts require an enthusiasm for food and its effect on health. You should also possess a variety of personal skills such as problem solving attributes, creative thinking and the ability to work independently as well as collaboratively. As the health, nutrition and wellness industries continue to grow, employment prospects for graduates of this degree are promising. In fact, in Australia the nutrition industry is predicted to experience 37.1 per cent growth through to November 20201. Community nutritionist: create changes in attitude toward nutrition and health; provide advice, guidance and support to the community. Health promotion officer: use social and environmental interventions to improve the health of groups and individuals. Sports, exercise and fitness nutritionist: responsible for improving the health and optimising the performance of athletes. Food Scientist: use chemistry and biology to look at the microbiological, chemical and physical properties of food and ingredients. Analyse nutritional content, discover new food sources, and ensure that the manufacturing process is safe. Product development manager: develop new and innovative products to meet strategic business objectives. Microbiology specialist: work in food manufacturing or government to research microorganisms in order to prevent disease. Food policy advisor: provide health and nutrition advice to the public. Food safety advisor: conduct food and safety reviews and monitor procedures to ensure standards are met. Research scientist: plan and conduct laboratory-based investigations, experiments and trials and analyse results in order to broaden scientific understanding. Graduates of the program are eligible to apply for professional membership of the Australian Institute of Food Science and Technology (AIFST). Graduates of the program are initially eligible to apply to the Nutrition Society of Australia for registration as an Associate Nutritionist (ANutr), leading to Registered Nutritionist (RNutr), usually after three years of experience. In this degree, we have a team of passionate teachers and researchers who strive to provide graduates with expert knowledge and a practical background in nutrition and food sciences. Our graduates are able to enter the workforce with expert knowledge and practical skills to begin their career in this rewarding field. While studying I undertook a valuable week-long field trip to Port Augusta, working with Aboriginal communities and school children. We worked with families and children to promote healthy eating and maintaining a healthy lifestyle and volunteered for a local community festival. Academics, staff and students at UniSA were very supportive. I also benefited from the diverse facilities and practical experience the degree provided, including an 8-week summer scholarship program, where I was exposed to health-orientated research and gained first-hand experience in data collection, entry and analysis.